How to resign in style – a piece of cake! 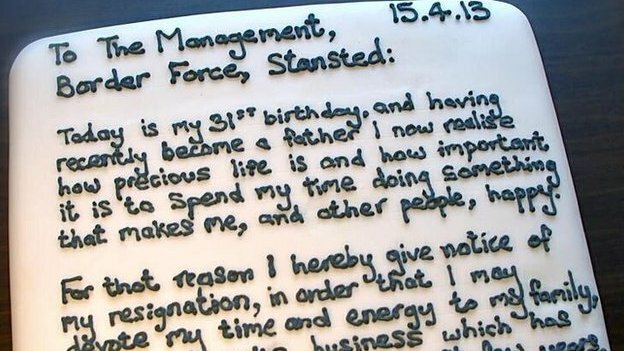 A former worker in the security team at Stansted airport has attracted national media coverage after he resigned from his workplace – using a cake. Mr Chris Holmes, who worked in the Border Force, resigned from his job after telling his bosses that he wanted to devote more time and energy to his family and his burgeoning cake business. He therefore presented his resignation on a passion cake which, from all accounts, delighted his fellow workers.